What did I use for this tag? Three stamps (all brand new) , seven ink pads and a gold pen! 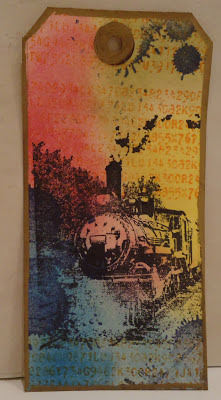 The stamps are a train stamp from Artistic Outpost 'Steampunk' sheet; Paper Artsy inkblots and a Hampton Art numbers stamp. Firstly, can I say hello to my followers...I'm so flattered that you've been kind enough to follow my blog and I love your visits and comments. This card is for CD Sunday Hugs and Wishes challenge. The bears and sentiment are from the CD Forever Friends Black and Gold. The papers are Craftwork Cards and came free with a magazine ages ago. 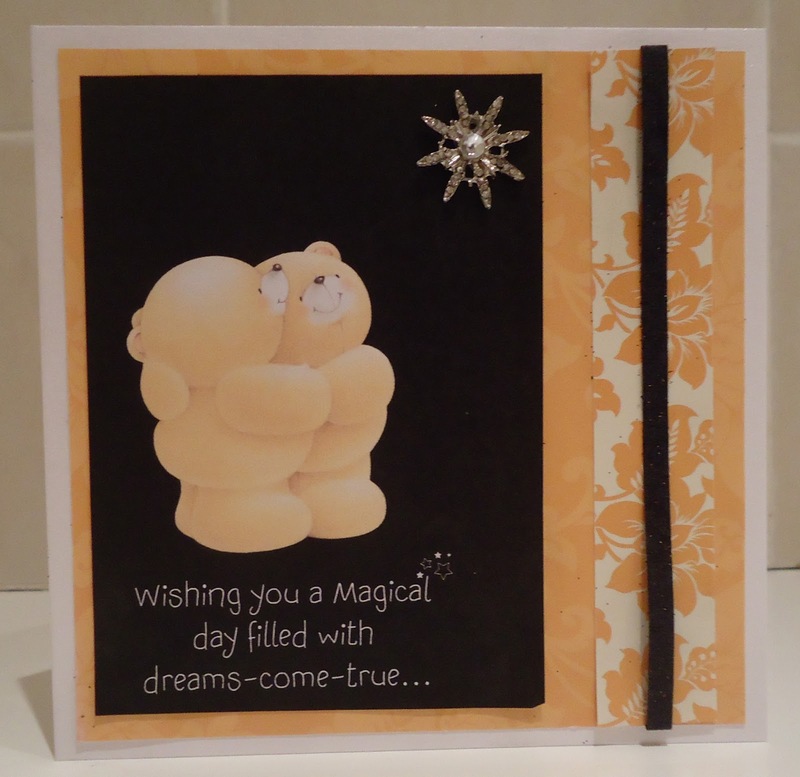 The 'star' was from a pack of two that my little boy picked out at Stamperama , so it's one for me, one for him. Wonder what he'll do with his? 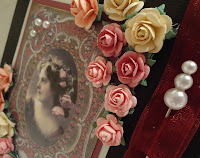 I usually think of vintage images as being soft and muted - and there are many of those images available from the Inkspirational Challenge sponsors this month , Eclectic Anthology. 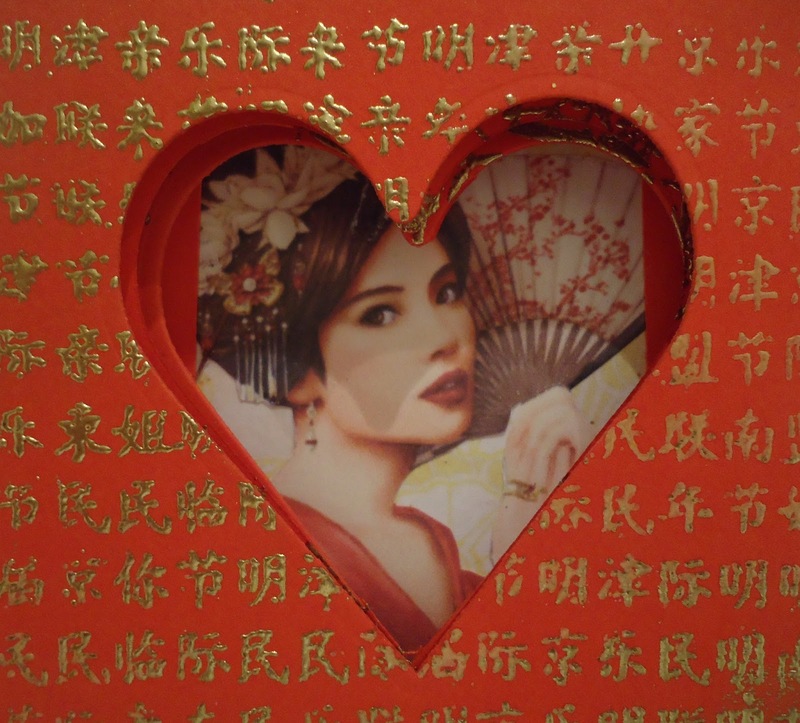 This one though (also from Eclectic Anthology), is a bit more kitsch and brightly coloured. I know sometimes they used to colour in photos after developing them. I wanted to play up the colours and using the sketch gave me a great framework to do this. What will YOU do with this sketch? Please come and join us at Inkspirational Challenges and show us what you've done. I originally made this tag for the Dynamic Duos Challenge 'Island Indigo and Pool Party' but I'm a little bit worried about whether it fits the brief . 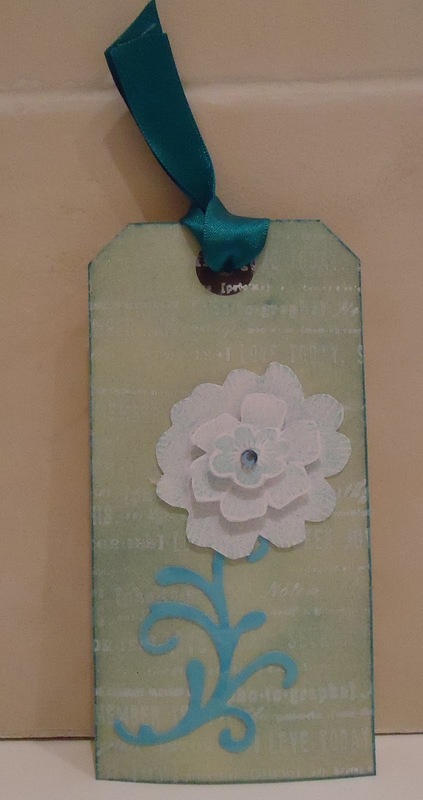 It looks like I've used more than two colours but I'v used a turquoise Promaker on the flourish/stem andStampin Up Pool Party ink on the flower (pale on white) and on the tag (manila tag, which has made the ink look more green). 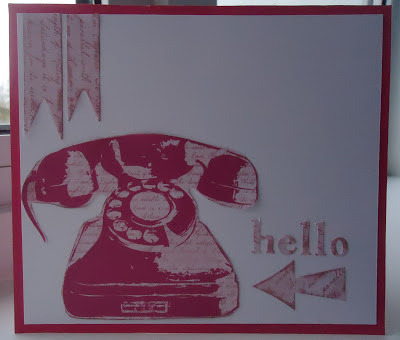 Apart from that I've used white ink for the text and a stronger teal-coloured ribbon. The stamps are by Stampin Up (flower) and Hampton (text). 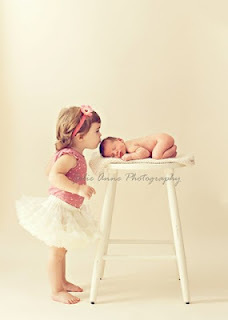 Come over and join us at Pinspirational Challenges﻿, and show us how the photo inspires you. My son with Barbara Gray of Clarity Stamps. I went to the Stamperama show in Stevenage today and for the first time took my 6-year-old son. He was incredibly good for the first two hours! He was happy to watch a very inspiring demo by Lin at Paperartsy. 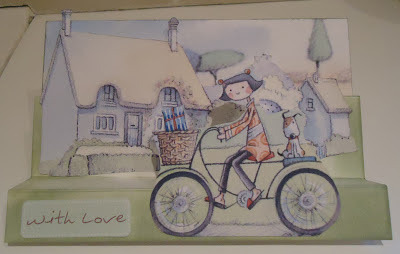 After a bit of shopping (including a Kanban Spiderman sheet) we went to watch Barbara Gray of Clarity stamps. 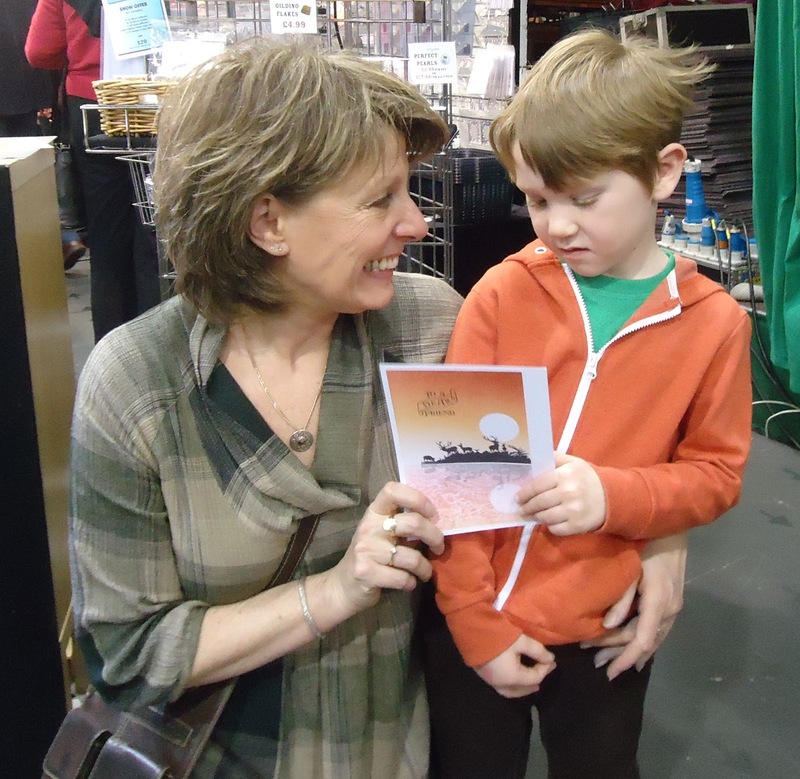 Again, he loved the demo and Barbara kindly gave him the card she made AND allowed me to photograph them with it. 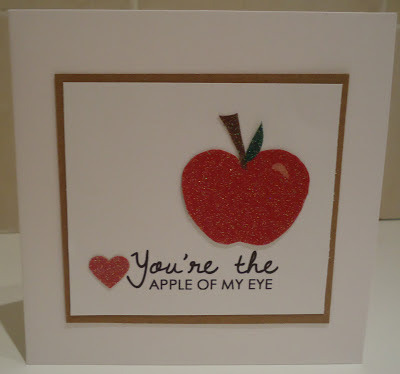 As you can see, I kept many of the original elements - the 'clean and simple' look, the apple and the heart (although placed separately) and the position of the sentiment. This sentiment was custom-created by Mynette Kitchen , owner of the Inkspirational Challenge, as a prize when I was featured on another of her challenge blogs (Technique Time Tuesday). Please come over and join us at Inkspirational Challenges and take part in the challenge. It's my grandson's birthday next weekend. 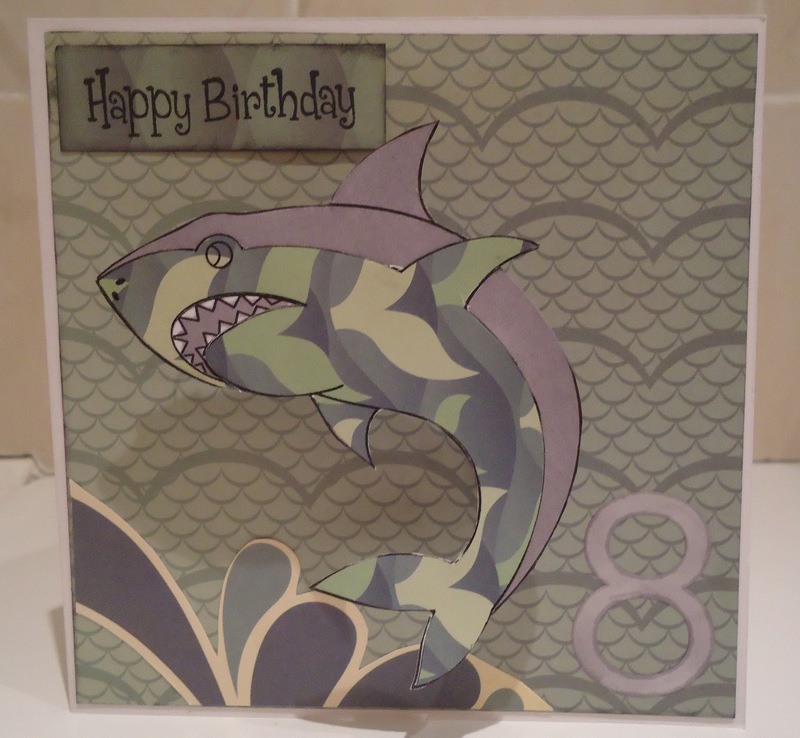 I recently bought him some bedding with sharks on it, so I wanted to do a card on the same theme. I found an image of a shark on a website of children's colouring-in pages.I coloured it in and paper- pieced it. All the papers are leftovers from Cosmo Cricket 'Salt Air' and the number eight is a sticker that I coloured to match (if you can call grey a colour!) . 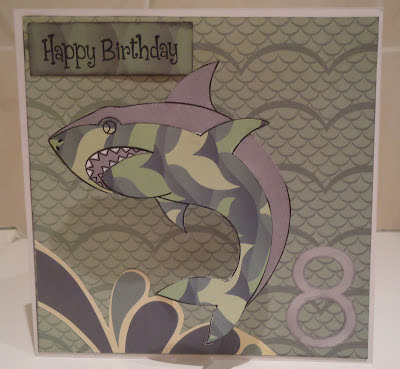 I stuck the shark on using Papermania springs - they don't seem very flexible so I'm not sure how I'd get it into an envelope - good job I'll see him on the day and don't need to send it through the post! Last night, that was my Trivial Pursuit answer to the question 'In the video for which song did Lionel Richie play a blind sculptor?' And it won me the match!!! In this card (which I may use to taunt my bad loser partner), I used a phone image from Docrafts Digital Designer 'Portobello Road' CD. I recoloured it in raspberry pink. The text background was on the same CD and I recoloured that, put it behind the phone, printed and cut it all out. The other elements are all die-cut : banners (Crafty Sentiments), arrow (Cuttlebug) and letters (Papermania). This card is for my son's grandad who is a football fan. I used 3 elelments from Docraft Digital Designer Tulip and Friends CD. 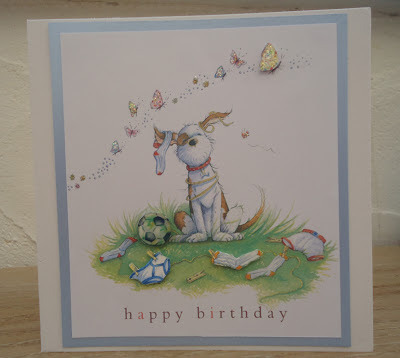 The butterflies aren't designed to go with the dog but I liked them as I like to add a bit of prettiness to men's cards! I cut out an extra copy of the football, one sock, one underpants and one butterfly and layered them on with 3d foam to add dimension. I added glitter to the butterflies and a layer of Crystal Lacquer to the football to make it shiny. 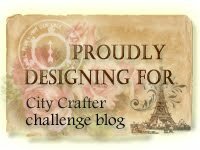 Craftroom Challenge- Something for a man. For my background in this card I went back to an old favourite -Marvy Metallic Markers and water on glossy card. I used red, green and gold markers for this piece, and although the gold dominates, it has a variegated effectg that I hope can be seen in the photo. I stamped with an Indigo Blu text stamp, then the bird stamp - it's a UM and I have no idea what make. I used a Docrafts Triboss folder , sanded and added 3 gems. 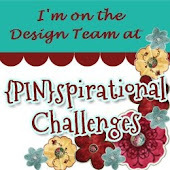 I'm excited to tell you that I've joined the design team for Pinspirational Challenges. Here's how it works - every week Pinspirational post a picture, and all you do is use it as inspiration for your project. There are two sponsors every week, so a good chance of winning a prize. In addition, the DT get to make a project using images from the sponsors. I've used an image called 'Daydreaming' from the sponsors, Freshly Brewed. 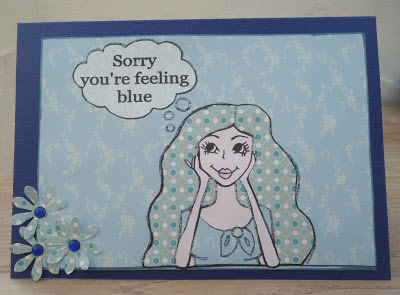 I was inspired by the blue hair and nails in the Pinspirational picture and it reminded me of the term'feeling blue',so I created the text in the thought bubble to match. Please come and join me at Pinspirational Challenges and show us how the picture inspires you. 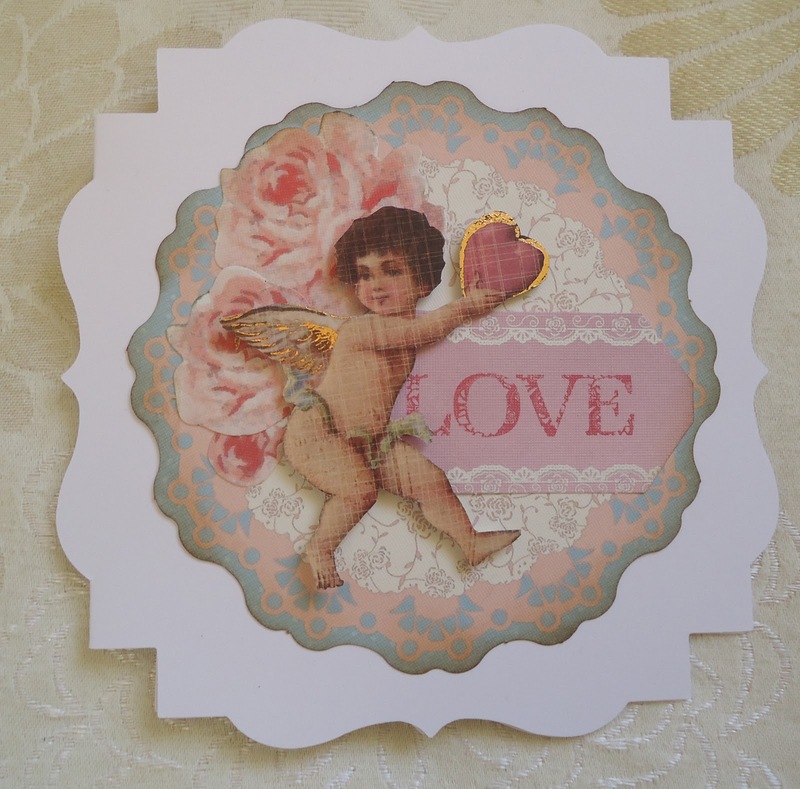 This week's theme at CD Sunday is 'Spring is in the Air'. One of my favourite things about spring is seeing the blossom on the trees , so I set off to search my CDs for a blossom image. I found this one in My Craft Studio 'Quintessential Country Garden', and went for the black and white digi-stamp version in the NSR section. Then I created the sentiment using the Add Text button. After printing, I coloured in the blossom using Promarkers. I made the background paper by grabbing a 'colour' from the same Cd and covering it with multiple blossom images. 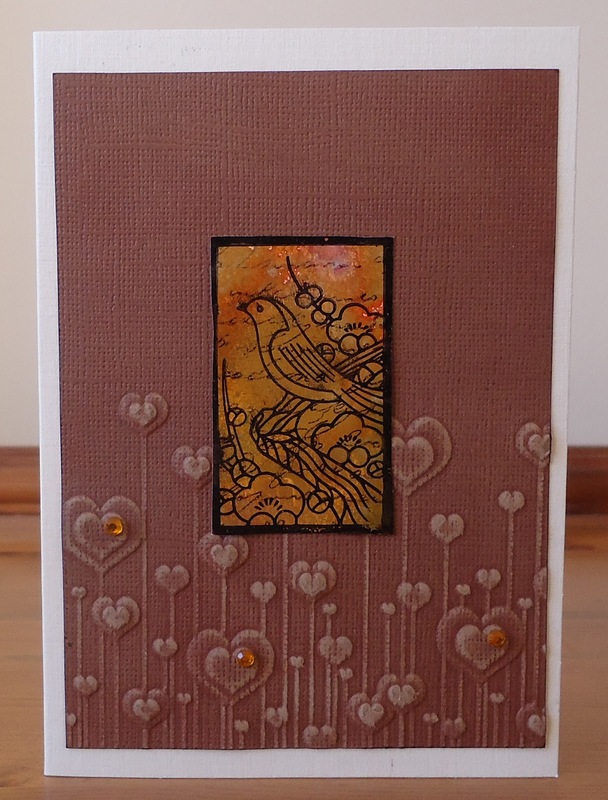 Now I look at my finished card , I realise it isn't what most people would consider to be a 'spring' card (including me!) No green, for example! Never mind: spring hasn't quite made it to my area yet,so I'm sure I'll have plenty of time to perfect my spring-y card look. I'm not always very good at following instructions for techniques, but I thought I'd have a go at the 'embedded image' tutorial at Technique Time Tuesday. This was not my first attempt! 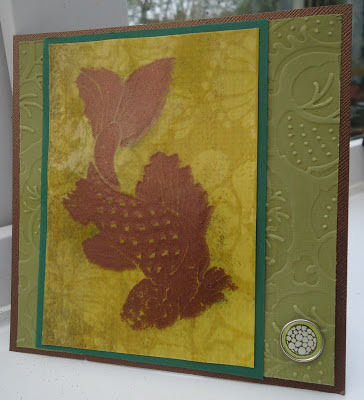 I tried two other stamps and different colours of embossing powder but I found it worked best with copper embossing powder and my old friend, the koi stamp. I like the effect created by the technique...a bit like enamelling. I think I'll be using it again. 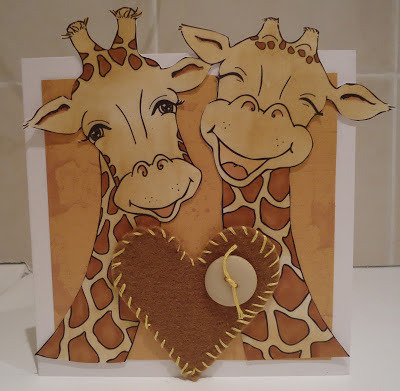 These giraffes are digi stamps from D2D. I had printed them out, large, a while back and then done nothing with them. But when I saw the Pinspirational Challenges picture, I decided to dig them out and see what I could do with them. I'd also like to enter this for Raise the Bar Challenge 'A Couple of Things'. Here's my DT project for Inkspirational Challenges' Photo Inspiration. (See picture below) . 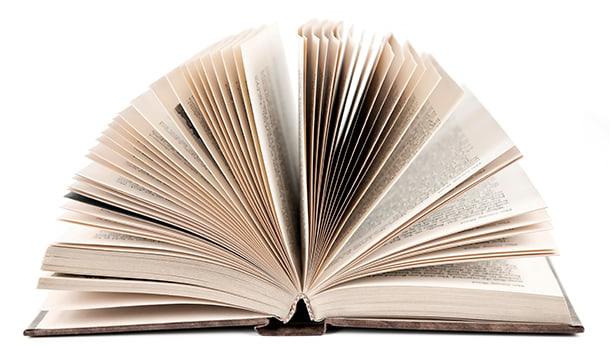 We are sponsored this month by Ecletic Anthology . They have lots of great freebies on their website but I couldn't resist buying their set of '500 antique and vintage images of actresses and dancers.'. Please come over and join us at Inkspirational Challenges and show us how this photo inspires you. ...then two come at once! You wait for ages for a bike card, then two come at once! (I'm not sure if that's just a British joke!) Anyway, this is my second card with a bike on it this week. This bike is a Stampin Up stamp. The yellow checked paper is one side of an Authentique patterned paper and the strip of paper and cut out flowers are from the other side. My daughter's birthday is Valentine's Day. 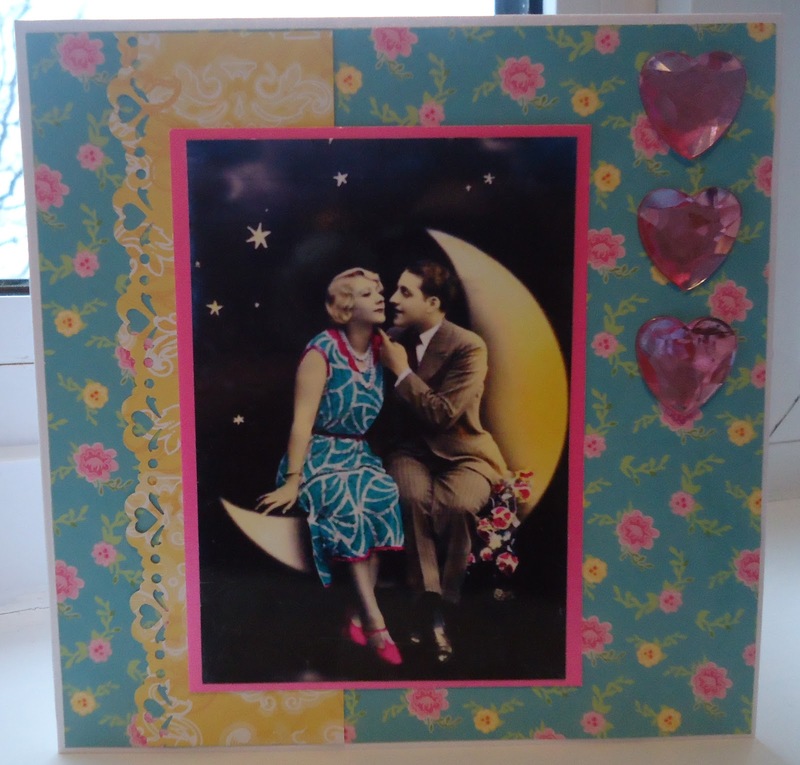 She told me that her favourite card that I ever made her was one I made with a WS Designs screen card template. 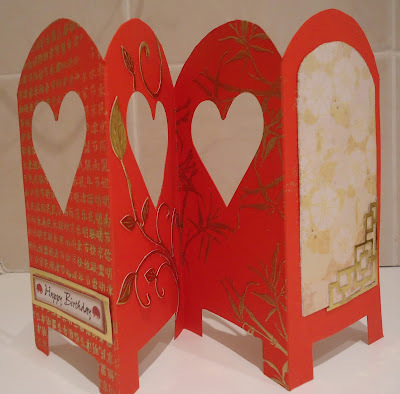 That card was in white and green, so this time I cut the screen from red card and die-cut heart apertures. I was inspired by the 'Asian' challenge at Artful Times and decided to give it an Oriental theme. I used an Oriental woman image from Debbi Moore (although I don't feel these women look very Oriental - more like Europeans with kohl and kimonos - very pretty though). 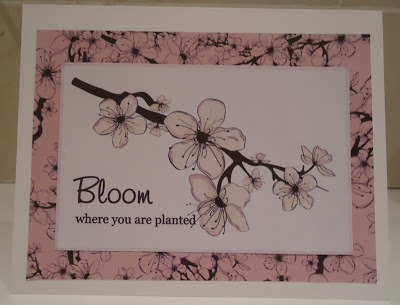 Also on the view above, I used Papermania Oriental stickers, Debbi Moore cherry blossom stamp, Marianne die bird on branch and Sizzix architectural corner. In this view you can see Oyster Stamps Chinese (?) script stamp, Cheery Lynne Fancil Flourish die and PSX bamboo stamp. The back panel will be for my message. This is what it looks like folded up. 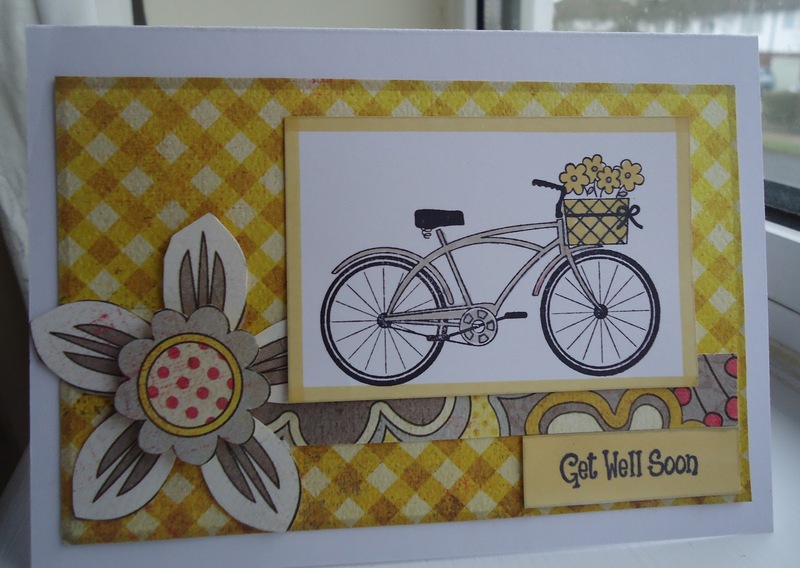 This week's challenge at CD Sunday is On Your Bike. I used the Docrafts Digital Designer Tulip and Friends CD. 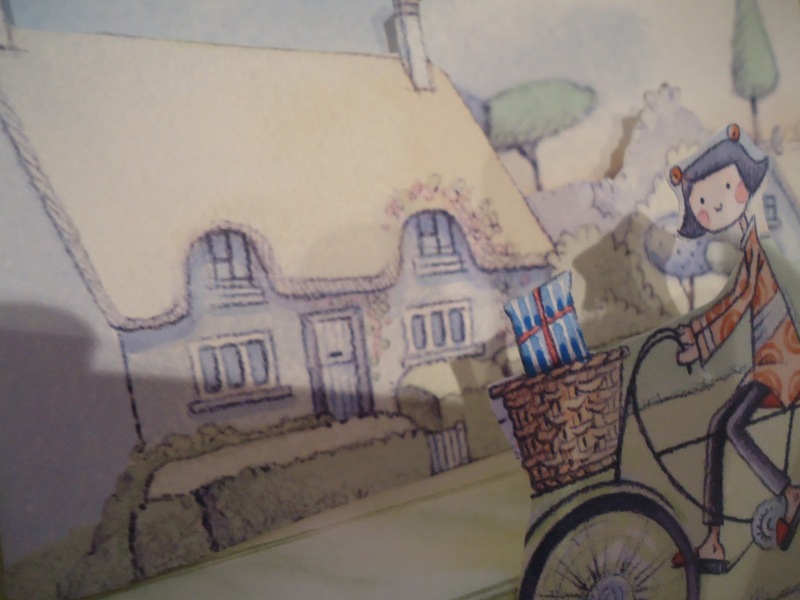 I wanted to get a layered effect with scenery, the village and Tulip on her bike at the front. Then I discovered there was no plain scenery without characters on the CD, so I digitally punched part of a topper and enlarged it to make the furthest back panel. I custom- made a stepper card (basically I kept folding and sticking bits until it did what I wanted ) and sponged it with Bundled Sage distress inks. Then I stuck on all the bits! Valentine's cards are such fun to make that I've already made several this year , but this is the one I'm actually going to give to my partner. Why? It's not too fussy and it's very clear what it's supposed to be, using traditional colours and motifs. 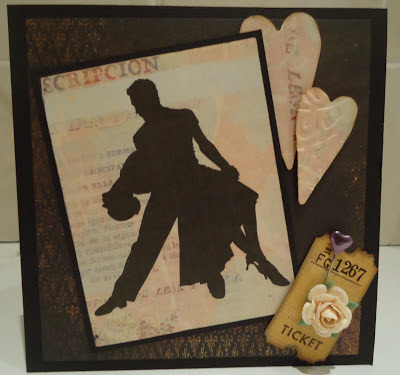 My man is no Tim Holtz!!! 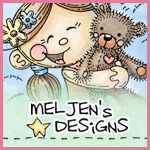 This lovely image is from Jellypark - this is a new , paid-for image but they also do great freebies if you join their club. 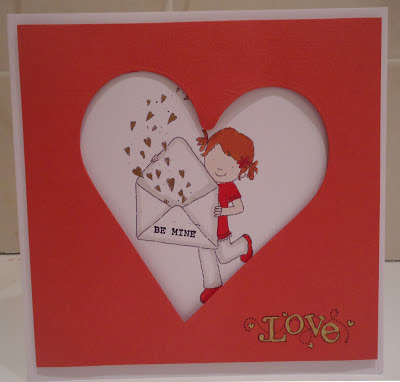 I used Stampin Up Outlined Occasions set to stamp 'Be Mine' on the envelope and 'love' and I coloured the hearts and sentiment with gold pen. I gave the little girl ginger hair, just like mine. This week's Inkspirational Challenge is a colour challenge - kraft, semi-navy and plum (see picture below). For my DT project I made a notebook made from tags. I cut the tags from kraft cardstock by Papermania. It's from a pack which has some plain, some lined, some graph paper etc. The flower ( or is it a grass?Well, the natural-looking item!) 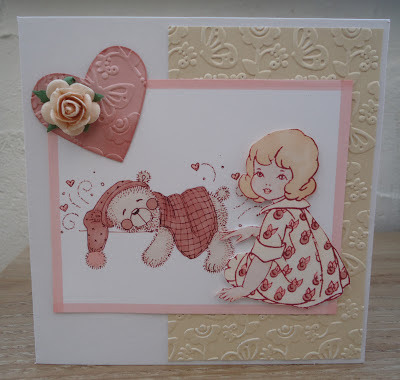 is by Artemio and I stamped it in two colours of distress ink. The 'things to do' stamp was free with a magazine. 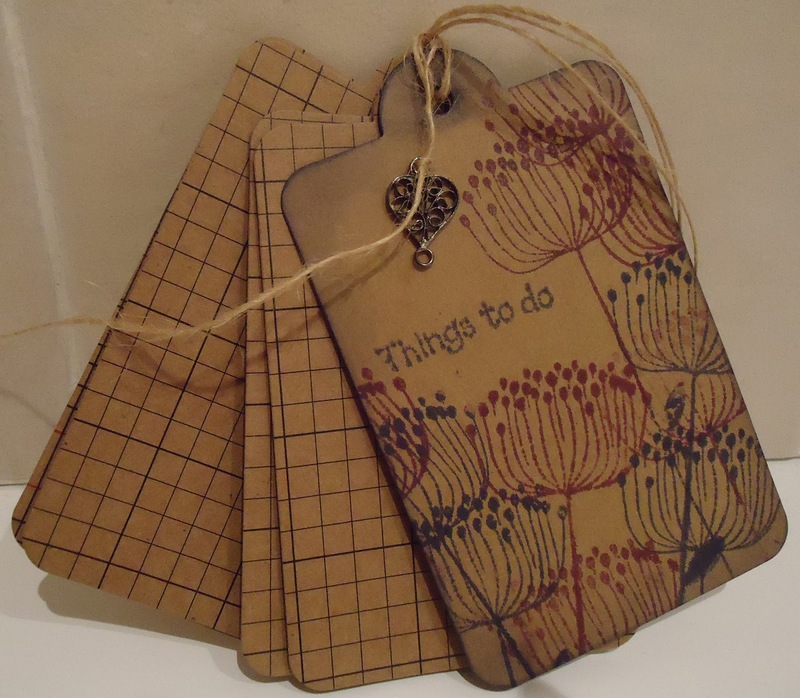 I tied it together with twine, so I can add more pages when I have more 'things to do'! Please come over and join us at Inkspirational and show us what you do with kraft, semi-navy and plum. CD Sunday's challenge this week is 'Showtime'. I chose this image from My Craft Studio Simply Silhouettes CD. The pastel-ly patterned paper was from the CD as well. 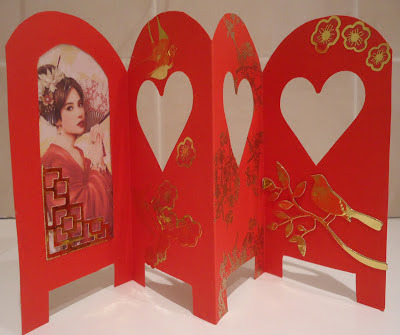 With Valentine's Day coming up, I was motivated to add some die cut hearts and a heart shaped hat pin. 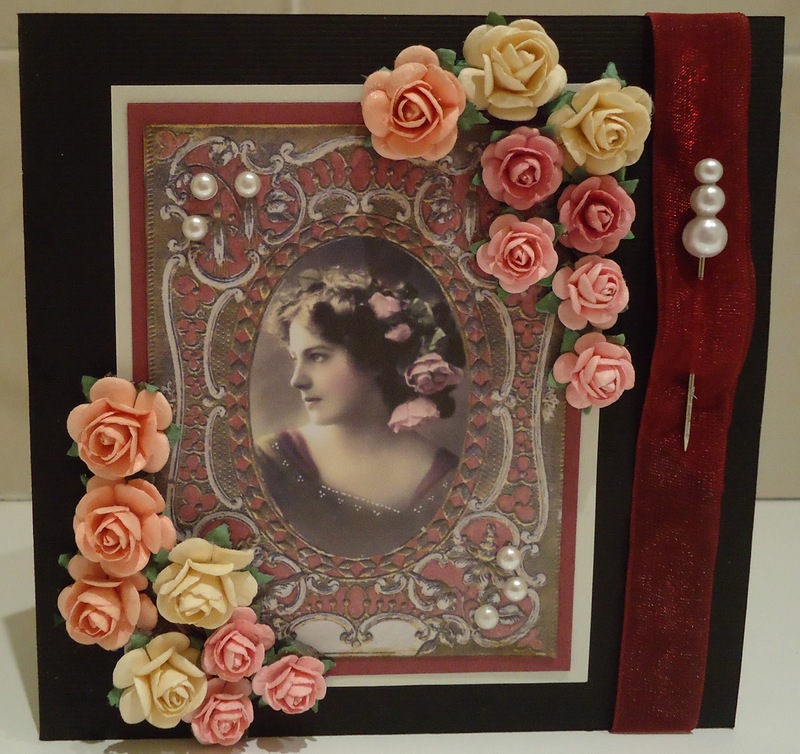 I wanted to make a Victorian-ish Valentine's card that didn't look old - one that looked like it might have done when originally sent by gentleman admirer! Does that make sense?